The parish of Sculthorpe is situated in the north of Norfolk. It lies to the north of Hempton and Dunton, south of Barsham and west of Fakenham. The name Sculthorpe derives from the Old English meaning ‘Skuli’s hamlet’. 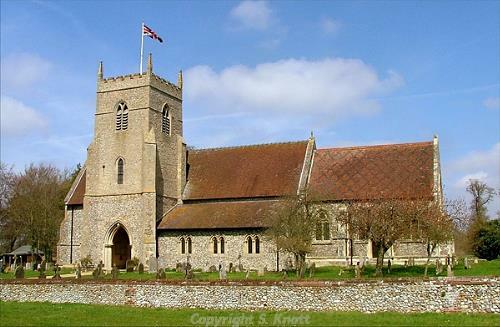 The parish has a long history and was certainly well established by the time of the Norman Conquest, its population, land ownership and productive resources being detailed in the Domesday Book of 1086. This document lists it as land held by Count Alan, and states that the fifteen acres of Sculthorpe paid 20d tax. The earliest site of archaeological interest identified in the parish is a scatter of prehistoric pot boilers (NHER 2001) found to the west of Cranmer Lodge. However, rather surprisingly there are no finds from Sculthorpe that date to the earliest periods of prehistory (the Palaeolithic, Mesolithic and Neolithic). A possible Bronze Age ring ditch (NHER 36142) was identified on an aerial photograph taken in 1996. In addition, the most significant prehistoric find also dates to the Bronze Age; a gold torc (NHER 21704) discovered on the surface of a field in 1984. Sadly, the Iron Age in Sculthorpe is represented by a single silver coin that was identified as a Wolf Stater (NHER 31575). During the Roman period a major road (NHER 1791) passed through Sculthorpe. The road is visible in some parts as a hollow way but in other parts the traces of it are so faint that they only show up on aerial photographs. Despite the presence of this road only one Roman feature has been recorded for the parish, with a refuse pit containing pottery sherds and animal bones found to the northeast of Cranmer Hall in 1881 (NHER 1998). At a later date a Roman smother kiln and more pottery sherds were found at the same location. Almost all of the Roman finds from Sculthorpe are coins that have been recovered by metal detecting (e.g. NHER 2130 and 31644). The most exciting find from the parish of this era is a copper alloy figurine of the god Mercury that was found in Cranmer Park in 1996. More mundane items or Roman date have also been retrieved and these include a terret (NHER 29821), lead weight (NHER 36620) and brooch (NHER 31646). Very little evidence of Saxon activity has been recovered from Sculthorpe. The majority of items of this era were found to the north of Grange Farm and consisted of an Early Saxon brooch, a Late Saxon buckle and a Middle Saxon/Late Saxon lead weight with gilded Viking animal ornamentation (all NHER 29281). The only other Saxon object on record for Sculthorpe is a Late Saxon lead spindle-whorl with decorated surfaces (NHER 21704). One would think that the most obvious reminder of the parish’s medieval heritage would be the parish church. St Mary's and All Saints' Church (NHER 1999) does have medieval origins but most of the currently visible exterior is Victorian. The chancel was demolished in the 18th century and the rebuilt one, completed in 1847, features extravagant Decorated windows. Inside there is a Norman font decorated with figures relating to the Adoration of the Magi, a charming 18th century organ case and a memorial to Major General Sir John Thomas Jones of Cranmer Hall (NHER 2002). Sculthorpe had two wayside crosses during the medieval period. Parts of one of these crosses survive at the crossroads of the B1105 road (NHER 15477), but no trace has been found of the other one (NHER 21722) that was supposedly situated northwest of Moor Lane. Ordnance Survey records also show a medieval manor house at the site of Manor Farmhouse (NHER 2003). However the current building here dates to around 1800 and is clearly unrelated to this medieval manor house, although it is possible that some of the moats surrounding the current property may predate it. A small selection of medieval objects has been retrieved from various locations across the parish. Metal detecting has found two lead ampullae (NHER 29427 and 20187), one of which had chevron decoration (NHER 20187). A fine seal matrix depicting a stag with a cross between its antlers has also been found along with more common items like buckles (NHER 36972), horse harness pendant (NHER 35103) and a jetton made in France (NHER 31540). During the post medieval period a number of grand buildings were erected in Sculthorpe. The most eminent of these is Cranmer Hall (NHER 2002) which dates to 1721. It is made from red brick with a slate roof and the seven bay facade originally had three storeys but has been reduced to two. The main entrance has a later 18th century Roman Doric wooden doorcase and the lead down pipes have gilded crests. Inside, there is a central three bay hall with plaster dado and panelling. 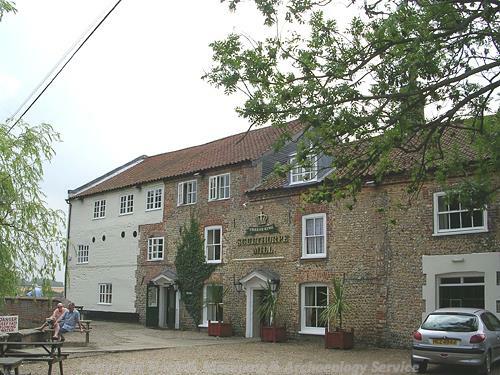 The former rectory, now known as Sculthorpe House, was also built during this period (NHER 21723). This striking building is made from a double pile of brick and pantiles and has gable chimneystacks and was built in around 1812 on the site of a 17th century mansion. Other properties listed as of interest can be found in Creake Road with the Tudor-Gothic style School (NHER 47681) dating to 1840 and Grove Farmhouse (NHER 47329) with its coped gable ends and simple Ionic porch dating to 1790. Sculthorpe was also home to two mills during the post medieval period, and these would have provided goods for the villagers as well as for trade. The one reputed to stand some 400m northeast of Mill Cottage (NHER 36191) no longer survives but rather more is known about Sculthorpe Mill (NHER 2006), which is still standing. This watermill and adjacent house date to 1759. The mill is taller than the house, of three storeys, with five bays to the east. The northern two bays are indeed of the same build as the house but the southern two, beneath which the millraces pass, are later in date. A brick immediately above the southern race arch was impressed with 'LUCKY' before it was fired. The building is now in use as restaurant but sadly was damaged by fire in 2002. The post medieval objects from Sculthorpe are unspectacular examples relating to everyday life. Examples consist of an early post medieval mount from belt or bag (NHER 29821), part of a bell (NHER 29427), a button (NHER 35103) and various coins (NHER 31898). Thomas Sunley (NLA) 14 May 2007.